Do you have dreams of going on a bicycle tour? Are you thinking about cycling across your home state? Exploring a foreign country on your bike? Or even pedaling your bicycle all the way around the world? You’re not alone! Thousands of people from all around the world go bicycle touring each and every year… and you can be one of them! Whether you’re planning a short bike ride near your home or a multi-year-long bicycle tour all the way around the world, bicycle touring can be an incredible, life-altering experience. There are so many wonderful reasons to go on a bicycle tour! Bicycle touring allows you to do something new. While on your bike tour, you get to experience places you’ve never been to before. You learn about new parts of the world. You get to try new foods and drinks. You have the time to recoup and/or rethink your life. Bicycle touring can challenge your way of thinking about the world. It allows you to discover new ways of doing things and/or approaching life. It gets you into nature. It allows you to share a unique experience with your traveling partner(s). It gives you a chance to accomplish something that is both mentally and physically challenging. It’s a great way to get physically fit, lose weight, tone muscles, or train for a larger bike ride or race. And it’s your opportunity to finally get some time to yourself. There are so many good reasons to go bicycle touring! Traveling by bike is an incredible, rewarding and memorable experience. But if you go out unprepared, your trip could be over before it’s even had a chance to begin! Each and every year, hundreds of first-time bicycle tourists try to do it all on their own. Many of them strike out from home without having done the necessary planning or preparation and end up quitting just a few hours later, totally defeated and feeling like a failure because they didn’t know what to expect once they hit the road. But here’s the good news: When you have someone working with you to help you figure out what kind of bicycle you should be riding, what gear and food you need to pack, how to plan out a safe and enjoyable bicycle touring route, and what to expect once you hit the road, you stand a much greater chance of completing your bike tour with ease. In other words, it’s good to have someone with an incredible amount of knowledge and experience guiding you through the process and teaching you everything you need to know before you even attempt your own bicycle tours. Let The Bicycle Touring Pro Be Your Guide! As one of the world’s most experienced bicycle travelers, the author of four popular cycling books, and the founder of BicycleTouringPro.com, Darren Alff has helped thousands of people JUST LIKE YOU plan, prepare for, and execute their own bicycle tours all around the world. As one of the world’s most prominent bicycle touring experts, Darren has come up with some simple, foolproof ‘strategies’ for conducting a bicycle tour of any length and has detailed his findings inside his wildly popular how-to book, The Bicycle Touring Blueprint. 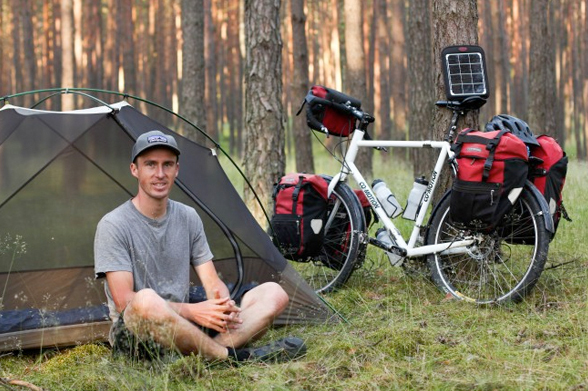 Inside The Bicycle Touring Blueprint, Darren will teach you his time-tested strategies for bicycle touring success. Of course, he also provides you with step-by-step instructions on every part of the bicycle touring process. So, you’ll have complete peace of mind knowing that once you get out on the road, you’ll not only know what you’re doing, but what you should expect along the way. The Bicycle Touring Blueprint is the world’s most popular at-home study guide designed to help you plan, prepare for, and execute your first bicycle tour. It’s a paint-by-numbers program that will give you the confidence to embark on the bicycle adventure you’ve always dreamed about. It’s the ultimate shortcut: a step-by-step bicycle touring system that removes all the guesswork, wasted time and frustration that plagues so many first-time bicycle travelers. The Bicycle Touring Blueprint has already helped more than 15,000 people from all around the world conduct their own safe and successful bicycle tours. 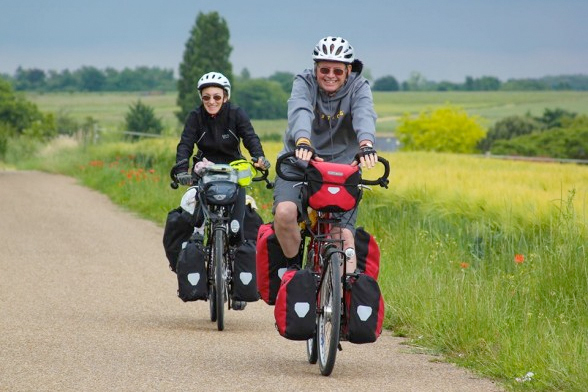 Now it’s your turn to hit the road and enjoy the wonderful and life-altering benefits of bicycle touring! The Bicycle Touring Blueprint is NOT like all those other outdated bicycle touring books you’ve read about before… nor is it some short and simple eBook about the basics of bicycle touring. The Bicycle Touring Blueprint is truly the biggest, best, and most modern information source on self-supported bicycle touring anywhere in the world. It contains more than 18+ years of on-the-road bicycle touring experience; it has helped thousands of people from all across the planet conduct safe and successful bicycle tours; and it contains everything you need to know in order to conduct your very own bicycle touring adventures! Just click the large BUY NOW button below and you’ll be taken to a secure order page. 1: How to pick a destination for your bike tour, plan a route, create a budget and schedule out your days. 2: How to select the right bicycle, gear, food and clothing for your tour. 3: How to mentally and physically prepare yourself for life on the road. The Bicycle Touring Blueprint covers all of this… and a whole lot more! Click here to buy it now. The Bicycle Touring Blueprint is broken down into three main chapters – each of which contains dozens of detailed how-to sections. How far should you expect to ride each day? What is the ideal length for a bicycle tour? What is the best time of year for bicycle touring? Where are the world’s most popular bicycle touring routes? Where should you plan to sleep at night? How to plan out a safe and enjoyable cycling route. Should you travel alone or with a partner/group? How to find a touring partner for your travels. What to know if you plan to go bicycle touring with children. How to bring your dog (or other animal) with you on your bicycle tour. How to come up with a budget for your bike tour. How to get your parents’ or family’s support for your bike trip. How to get press and media coverage for your tour. How to find sponsors for your travels. The major mistakes made by first-time bicycle tourists. Important bike touring words and definitions you should know. Sample bike tour planning timelines. Detailed packing lists for every type of bicycle tour. How to choose the perfect touring bicycle for your travels. What foods and drinks should you be consuming? How to keep your bicycle and other belongings safe. Do you need to carry a weapon of any kind on your travels? Common electronics you might choose to carry. How to power your electronics while you are touring. What important paperwork and/or documentation you must carry. Important things to consider before your buy any gear. Bicycle maintenance and repair skills you need to know. How much should your bicycle weigh? How to eliminate excess weight from your bicycle. How to prepare your bicycle for a long-distance tour. How to ride your bicycle in all sorts of different road and traffic conditions. Physical training you should do before you start your tour. The three major hurdles you will need to overcome at the start of your tour. How to get your bicycle and gear to the start of your bike tour. How to find the right pace for your travels. Tips for riding with a partner. How to deal with extreme weather conditions. What you need to know if you plan to travel after dark. Travel tips for female cyclists. Important words you should know when communicating in a foreign language. How to deal with animals and dangerous situations on the road. Information on how to camp anywhere in the world – for free! How to feel at home when you are traveling and living on the road. How to overcome the loneliness that often times strikes the solo bike traveler. Tips for traveling with a computer and a digital camera. Solutions to common on-the-road bicycle touring problems. Mental exercises you can perform to prepare for your bike tour. Ten things you might learn from your first bicycle touring adventure. How to successfully return home at the end of your tour. The Bicycle Touring Blueprint comes delivered as as either an PDF eBook or as a printed paperback workbook that is delivered to your home and is divided into three easy-to-follow sections that you can work through in your own time. Teaching lessons – an in depth discussion about an important bicycle touring topic, explaining both the WHY and HOW of that particular subject matter. A Task Sheet – something you will need to actually do in order to get yourself closer to conducting your very own bicycle tour. Further information – so you can dive deeper on any task and learn more about a subject matter in another book or on another website. This three pronged approach is designed so that you come away from the book having learned 1) how to conduct a safe and successful bicycle tour… and 2) have also taken the steps necessary to conduct your very own bicycle tour! You choose your own pace. The curriculum is not forced upon you or given to you on a rigid schedule. You’re busy… at work, at home, and just in life in general. So, one of the great aspects of this program is that you can go through it at your own pace. You can make a commitment to work on it for just 10 minutes a day with your morning coffee, or maybe work through a lesson a day after dinner with someone you love; maybe you will decide to read through one section a week on a Saturday morning or you can decide to go whole-hog and implement the entire program over the course of this upcoming weekend. The book has been set up so you can enjoy the information at your own pace – one that feels most comfortable to you. You can get started right away. You can get immediate access to The Bicycle Touring Blueprint. After placing your order, you’ll be sent an email with a special link to a page where you can download the book and begin learning right away! But don’t worry, downloading the information is a real snap (it works perfectly with both Mac and PC computers) and you can read the eBook on any computer, digital eReader or smartphone that’s capable of viewing PDF documents. Or you can choose to have the Blueprint mailed to your home. If you want a printed copy of The Bicycle Touring Blueprint, that no problem at all. Choose the printed, paperback copy of the Blueprint and a large, professionally printed workbook will be mailed to your home and arrive in a matter of days. If you want to underline important text, make comments in the margins and write out your responses to the tasks sheets included in the book, then ordering a paperback copy of The Bicycle Touring Blueprint is highly recommended. To place your order, just click any of the large BUY NOW buttons on this page and you’ll be taken to a secure order page. I have absolutely no cycling/bicycle touring experience. Will this book help me? Yes, The Bicycle Touring Blueprint is designed for people who have little or no bicycle touring experience. The book is designed to take you from the very beginning and teach you everything you need to know in order to conduct a safe and enjoyable bicycle tour anywhere in the world. I’ve already gone on one bike tour. Will this book help me? 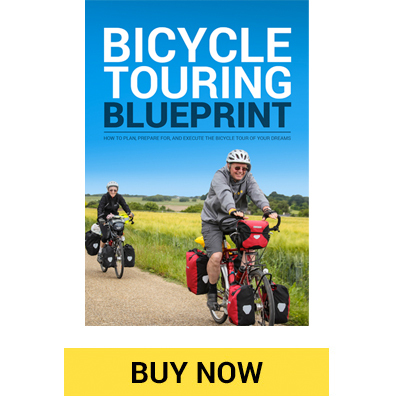 The Bicycle Touring Blueprint is not meant to be used by experienced bicycle tourists, but if you have conducted only short bicycle tours in the past, or you went on a guided or self-guided bicycle tour, and now you want to try self-supported bicycle touring, or you tried bike touring in the past but didn’t have a good experience, this book will help you a lot! How is this book different from other bicycle touring books that are out there? Almost all of the bicycle touring books that exist are short texts teaching 1970’s-style bike touring where the main focus is on the gear, clothing and equipment that should be used. But things have changed a lot in the bicycle touring world since the 1970’s when the act of bicycle touring first started to go mainstream. Not only has the world changed a lot in that time, but technology has totally revolutionized the way people travel by bike. The Bicycle Touring Blueprint is the most up-to-date bicycle touring book in the world. It not only details what kind of gear and clothing to use, but comes complete with two additional chapters about planning, preparation, and on-the-road bike touring skills you need to know about. An entire section of the book is dedicated to personal safety, common travel scams and the psychological challenges one might face on a long-distance bicycle tour… and none of this information is covered in any other book about bike travel. The Bicycle Touring Blueprint is priced at only $29.95 USD for the digital ebook edition… and only $39.95 USD (+ shipping and handling) for the printed version that is mailed to your home. What are you waiting for? Get started right now… and begin preparing for your dream bicycle tour!